NHI Instructor, Cynthia Ribeiro, Receives the AMTA 2017 Jerome Perlinski Teacher of the Year Award. Cynthia Ribeiro, NHI Instructor, and manager of the Advanced Neuromuscular Therapy Program is the American Massage Therapy Association (AMTA) 2017 Jerome Perlinski Teacher of the Year Recipient. Ribeiro came to the U.S from Brazil, where she earned an undergraduate degree in Physical Education and studied Surgical Nursing. Once in the U.S, she graduated from two massage school programs. She later founded the Western Institute of Neuromuscular Massage Therapy. In 2003, she was appointed Honorary Clinical Professor at the University of California-Irvine Medical School. 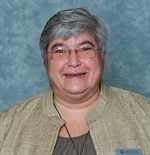 Cynthia was President of AMTA in 2012-13. We interviewed Ribeiro to find out what she loves about teaching, the path that lead her to become a massage therapist, and her advice on what it takes to be a successful massage therapy student. NHI: What does receiving the AMTA 2017 Jerome Perlinski Teacher of the Year award mean to you? Ribeiro: It means the world to me to win this award. In my view, it’s the most meaningful award I could have been acknowledged for. I came to the US from Brazil with the intent to learn as much as I could about being a highly skilled massage therapist, and always knew I wanted to teach in this industry. Massage therapy was a great continuation of my background as a Surgical Nurse and in physical education in Brazil. NHI: You’re so passionate about teaching! What do you love about teaching at NHI? Ribeiro: I LOVE working at NHI as a teacher and as the Advanced Neuromuscular Therapy Program Manager and Educational Specialist. As a former owner of a massage therapy school in Southern California, I was stretched too thin. With my role at NHI, I am able focus my passion and expertise where I’m most effective, in the classroom with students and with training the Massage Therapy instructors at NHI. NHI: In Brazil, you earned an undergraduate degree in Physical Education and studied Surgical Nursing. Once in the U.S, you graduated from two massage school programs. What made you decide to pursue massage therapy? 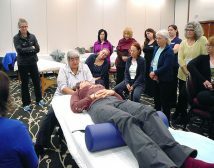 Ribeiro: I decided to pursue massage therapy because as a Surgical Nurse, I experienced first-hand the healing power of the mind and body, and how critical it is to focus on preventative healing modalities. NHI: How do you stay up to date on current industry trends and the latest massage therapy modalities? Ribeiro: I am a professional learner. I have always sought out continuing education classes to expand and support my current skills so that I can bring the latest information back to the classroom. I’ve found that volunteering at the AMTA is the best way to keep up with the trends and stay current in the industry. NHI: As someone who has experienced success in the industry, what advice would you give to someone who wants to be a successful massage therapy student? Ribeiro: In order to be a successful massage therapy student, it is necessary to be curious, and not be afraid of what you don’t know. Also, it’s important to have a true desire to help clients feel and function better as a whole. NHI: Massage Therapist truly have the ability to improve their clients’ overall well-being. How often do you get massages? Ribeiro: I literally get massages every other week, if not once per week from our Advanced Neuromuscular Therapy students! This gives me a great opportunity to give them thoughtful feedback.